Starting at Strawberry Flats walk along the old fire access road through the Lodgepole pine forest and through the flower meadow that is pretty in June with strawberry blossoms and perennials starting to sprout, and glorious in mid-July to August with a splash of bloom that attracts Hummingbirds and butterflies. The notable peak to the west is Red Mountain, 2469 m, named for the colour of its exposed iron ore deposits. About .4 km along the road, the trail narrows and heads south, on north facing slopes, through dense Engelmann spruce and alpine fir forest. Until late summer, you will find mud constantly underfoot until you approach the first meadow at 3.7 km, although corduroy logs help in several places. This area is more sheltered and is the beginning of a great bird-watching area that continues to the burn, caused by a forest fine in the mid 1940s. The burn gives a clear view of the valley below. The trail then goes on to a drier NWW-facing slope which offers an increasingly good view, from right to left, of the Red, Lone Goat and Snow Camp Mountains and a first glimpse of Mt. Hozameen in the United States. At 5.9 km you reach the Skyline I/Skyline II junction. Skyline II veers west and drops into Despair Pass. Following along the ridge the trail takes you past Snow Camp, 1980m, and Lone Goat, 2004 m, mountains. 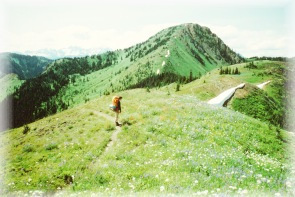 The views and wild flower meadows along this trail are spectacular. 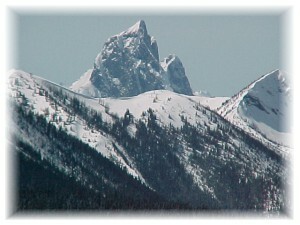 Directly below Snow Camp Mountain is Thunder Lake and Mount Hozameen dominates the southwestern skyline. Mowich Wilderness Campsite (approximately 1600 m elevation) is reached at 12.5 km from Strawberry Flats or 6.5 km from the junction. The wilderness site has a shelter and plenty of water. However, during a hot and/or dry summer the water is not always readily visible. It often drops to a trickle by late summer. If one follows along it, there are small pools. Look for the mule deer feeding in this area, (Mowich is an Native word meaning deer). At the height of land there is a narrow trail leading due south to Mt. Hozameen. Directional signs are located at this trail junction. From Mowich camp one can either, return to Strawberry Flats (12.5 km), return via Spruce Bay (20.5 km) or continue to the Silver Skagit Road parking lot (13 km) located in the Skagit Valley Recreation Area. A short walk from Mowich camp leads up to the last ridge, which forms the Skagit River divide and off to the southwest is Ross Lake. From here the trail winds its way down the valley towards the parking lot, passing the park boundary at 22.5 km. This descent starts off with beautiful sub-alpine meadows and panoramic views. The floral display in late July and early August is awesome. These flowery meadows continue for many kilometres. As there is no water along this trail you are advised to fill your canteens at Mowich camp. If you hike this trail during inclement weather conditions, be prepared with rain gear or you will find yourself soaked to your waist (possibly shoulders) due to trees, brush and meadow areas that you will traverse through. It is also possible to begin this trail from the western end by taking the Silver Skagit Road just south of Hope for 55 km. There is a parking lot at the trailhead. The elevation gain is 1310 m from the parking lot to Mowich camp and takes approximately 5 hours. Flora and fauna will be similar to that found on Skyline I with vegetation changes occurring as you reach the more coastal climate zone.